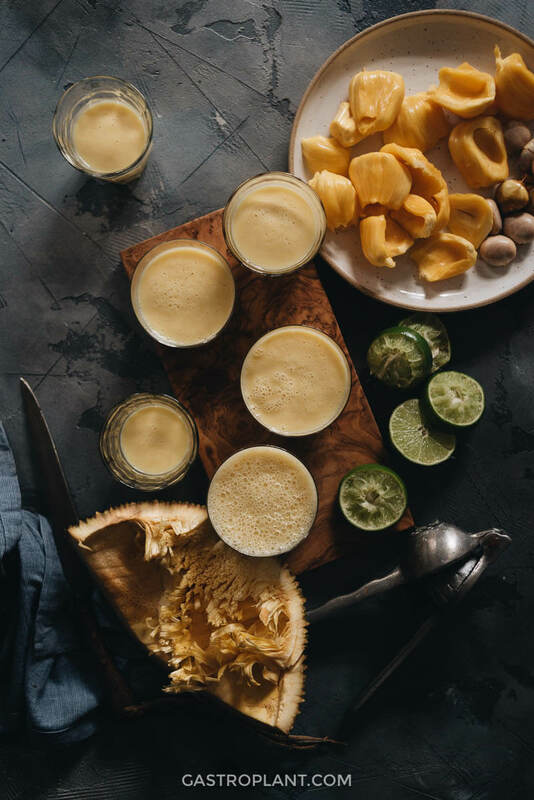 This 3-Ingredient Jackfruit Smoothie is sweet, creamy, and refreshing. 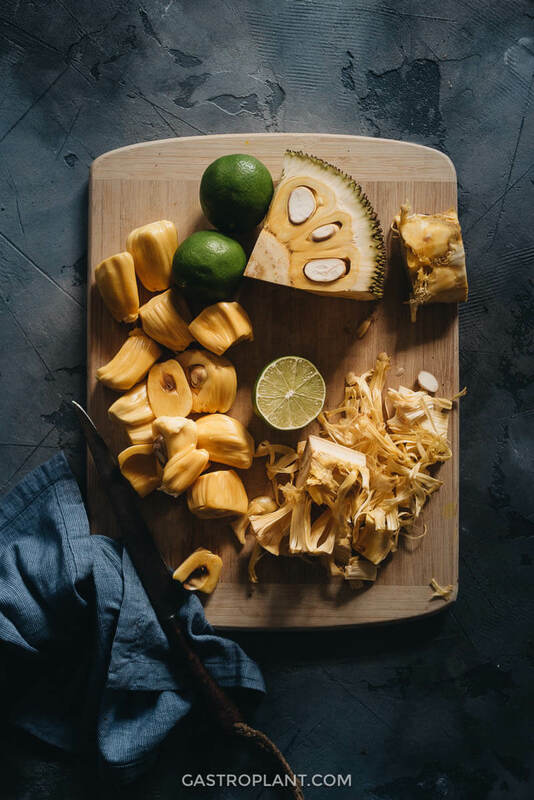 It couldn’t be simpler to make and really brings the best flavor out of fresh, ripe jackfruit. If you just bought a whole jackfruit on impulse and don’t know what to do with all of it, give this a try! I’m relatively new to jackfruit. I’ve used packaged jackfruit carnitas occasionally in tacos and Buddha bowls and enjoyed it, but never dealt with a whole, fresh fruit. They look pretty intimidating in their whole form – they’re huge and covered with spikes. I was curious to learn more about them though, so I picked one up. It weighed 15 pounds and had to be handled with gloves and wrapped in newspaper when I bought it. I wasn’t sure what to expect, but this fruit made me happy from the time I cut into it. It wasn’t as tough to cut through as I had expected and the aroma was fantastic. I tried a piece of the fruit and it was like a pineapple, but not acidic. After trying a few more pieces I could also see the resemblance in flavor to bananas. (I later noticed a likeness to two foods from my childhood – banana popsicles and circus peanut candy.) The texture is also satisfying – springy and meaty. I can’t think of a fruit that has a similar texture, so I’ll just say it has an interesting and unusual mouthfeel. The fruit was tasty enough by itself, but I felt like I should make something with it. It was a bit of work to bring the fruit home and dissect it. Further experimentation was in order. 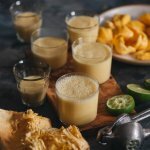 Wanting to keep things simple, I thought would be useful to create a drink that balances the sweetness of the jackfruit while still allowing the aroma to shine through. That’s where this smoothie comes in. 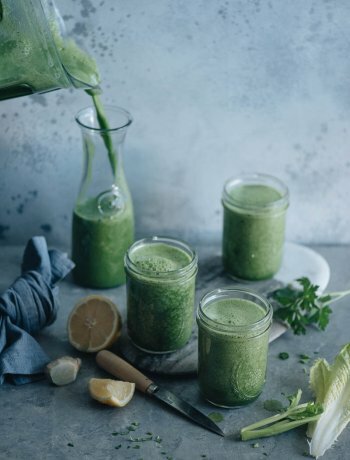 This smoothie is all about simplicity and pure flavor. 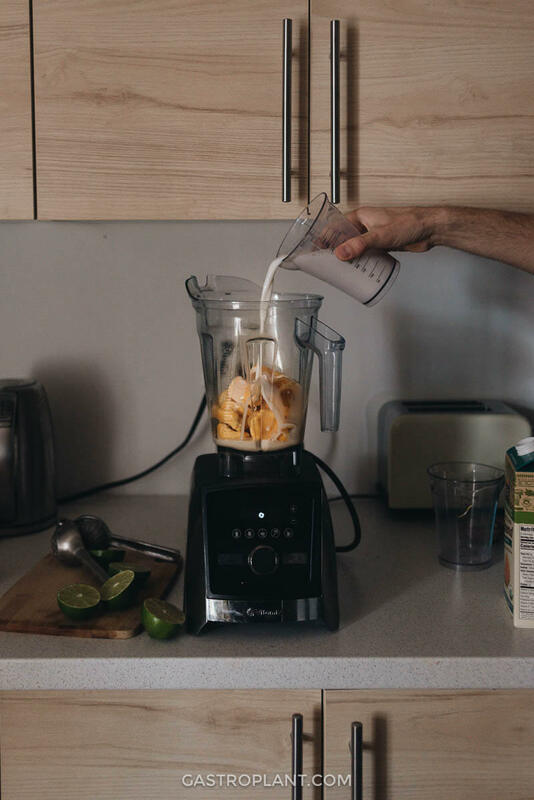 You just need to blend fresh, ripe jackfruit, lime juice, and your choice of plant milk. 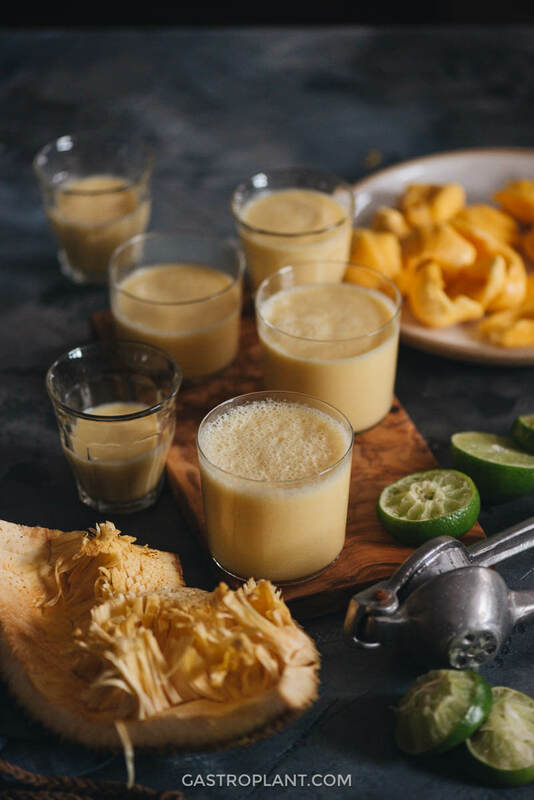 The lime juice cuts the sweetness of the jackfruit just slightly and makes the drink a little tangy. The overall flavor of the drink is still largely that of the jackfruit. Take care to remove all the seeds before blending the jackfruit. It may be easier to use pre-cut jackfruit if it’s available. A whole jackfruit is a lot to eat and a lot to carry, and it can be a bit of work to get the pods separated and de-seeded. This recipe is for fresh, ripe jackfruit. If you are interested to try it with canned jackfruit, be sure it is the ripe, not the green variety. And if the fruit comes in a can of syrup, you may want to rinse the syrup off so the drink won’t be overpoweringly sweet. The smoothie is great mixed with white wine. I haven’t tried it with spirits but would bet vodka, rum, and tequila make for a refreshing addition as well. If you want a frozen version of the drink, whether alcoholic or not, you can freeze the jackfruit before blending it. Just be sure the pods are well cleaned and the seeds removed before freezing. The smoothie will stay good for 2-3 days in the fridge. The drink becomes fairly thick when chilled. You may want to think it out with a bit more plant milk (or water) in this case. Combine all ingredients in a blender. Blend on high for 30 seconds or until uniformly blended. Serve or store immediately. Be sure to use ripe jackfruit, not green. 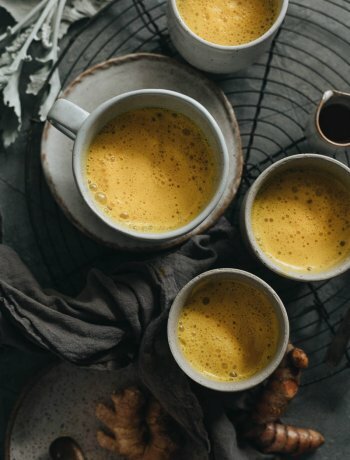 If your jackfruit is canned and packed in syrup, you may want to rinse it before blending so the drink is not overly sweet. Make sure there are no seeds or seed fragments in the jackfruit. You can store the smoothie in an airtight container in the fridge for 2-3 days. The smoothie will thicken once chilled. You can add more plant milk to thin it out. You can make a frozen version of the drink by freezing the jackfruit meat beforehand.